Holy crap, Batman! 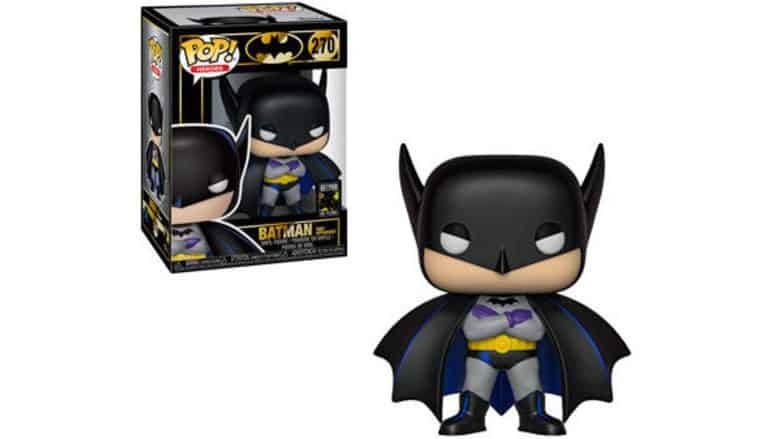 Popular toy manufacturer Funko is releasing their Batman 1st Appearance 1939 Pop! Vinyl Figure in March 2019. This figure celebrates 80 years since Batman made his debut appearance in the #27 volume of DC Comics’ Detective Comics series. Standing approximately 4 inches tall, this special (and cute!) Batman Pop! figure depicts the Caped Crusader standing tall in his signature pose with crossed arms, donning his iconic black cape and accompanying attire—those purple gloves are really poppin, too! It’s worth noting that none of the toy’s parts—arms, legs, or head—articulate. However, its head may rotate slightly, but it’s not meant to be rotated. It’s perfect as a standalone figure or to supplement an already thriving collection of figures. What I personally like about this figure is its size; it’s not too large, which means I can pack it up easily if needed and it’s not too small, so it won’t get lost among other figures or toys. But the figure is not the only cool thing about this. Let’s not overlook the fancy packaging, which emblazons the Batman logo and the number “270.” Some folks have asked what this number denotes and, quite simply, it’s Funko’s way of keeping track of how many figures are in each of its Pop! series. The Batman 1st Appearance 1939 Pop! Vinyl Figure is #270 in the Batman series. You can get your 80th anniversary Batman figure next month when it’s released, or you can pre-order to secure it before it’s possibly sold out. The retail price for this figure is $10.99. Pop! collectors should find this figure quite interesting due to its nostalgic feel. And, depending on how popular it becomes, these figures could make for a wise investment for those looking to sell it at a later date. Want more of the Dark Knight? Check out more cool Batman gifts here.